Effective bird management programs are best when they in-corporate the integrated pest management (IPM) approach. In some cases, the elimination of the birds food or water source(s) will solve the problem. Other times, something as simple as the repair of a broken warehouse window may be the solution. 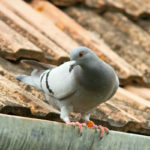 Often, however, when a professional is called upon to solve a pigeon problem, it is usually because the situation is complex and requires careful planning and integration of several approaches. Managing these urban pest birds contains five broad components; survey, sanitation, exclusion/habitat alteration, repellents, and population reduction.